President Donald Trump ordered a strike on Syria Friday in response to last weekend's chemical weapons attack. Addressing the nation Friday evening, Trump said the strike was a joint operation with France and the United Kingdom. "A short time ago, I ordered the United States Armed Forces to launch precision strikes on targets associated with the chemical weapons capabilities of Syrian dictator Bashar al-Assad," Trump said. President Donald Trump addresses the nation on the situation in Syria April 13, 2018 at the White House in Washington. Trump said strikes on Syria are under way. Trump said that the "massacre" last weekend in Syria "was a significant escalation in a pattern of chemical weapons use by that very terrible regime." "The evil and the despicable attack left mothers and fathers, infants and children thrashing in pain and gasping for air. These are not the actions of a man," Trump said, referring to Assad. "They are crimes of a monster instead." 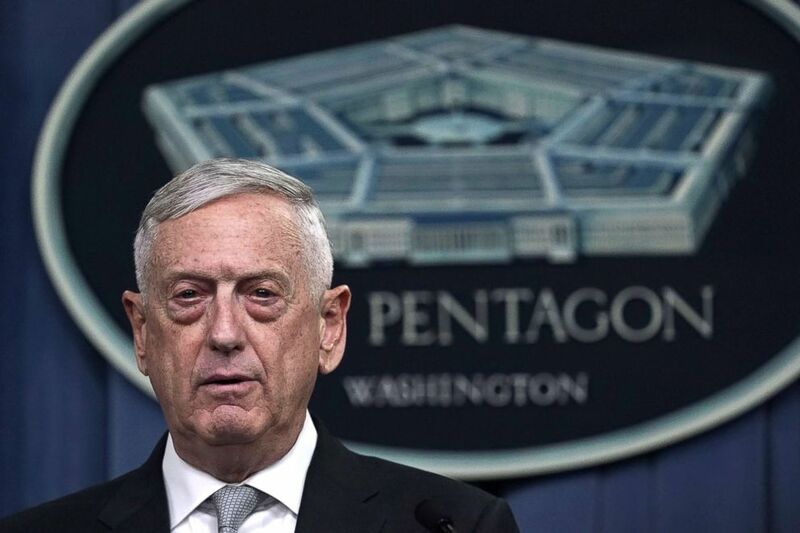 In a later briefing, Defense Secretary James Mattis said the strike demonstrates the international resolve to prevent the use of chemical weapons, saying he is "confident the Syrian regime conducted a chemical attack on innocent people in the last week." 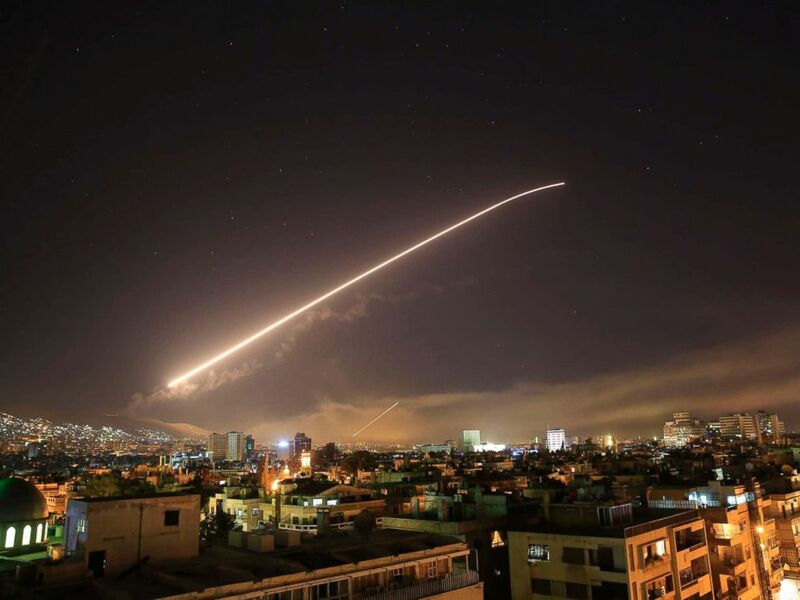 Damascus sky lights up with missile fire as the U.S. launches an attack on Syria targeting different parts of the Syrian capital Damascus, Syria, early Saturday, April 14, 2018. "Clearly the Assad regime did not get the message last year," Mattis said, adding that this time the U.S. struck harder. "We have gone to great lengths to avoid civilian and foreign casualties," he said. "... I believe that we sent a very strong message." 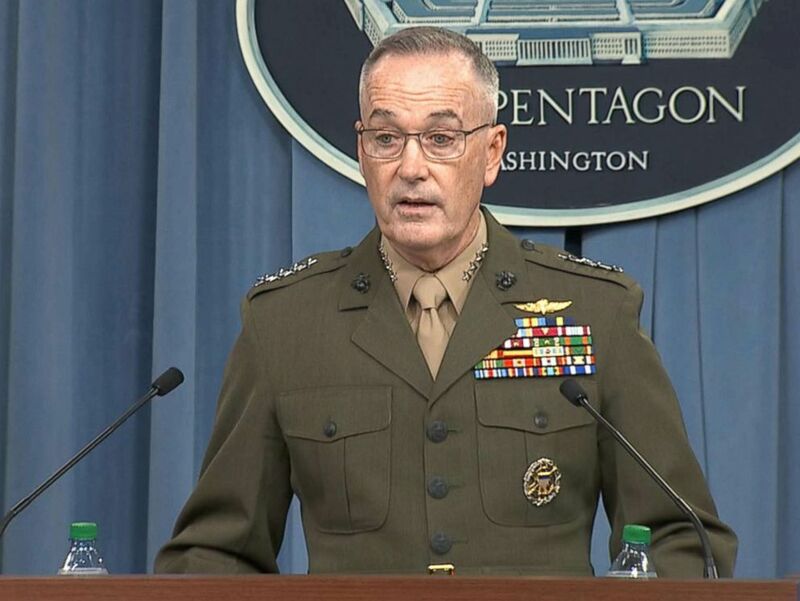 Chairman of the Joint Chiefs of Staff Gen. Joseph Dunford said the strike specifically hit three targets associated with the production and storage of chemical weapons: a scientific research center; a storage center for sarin and its precursor components; and a chemical weapons storage facility and command post. 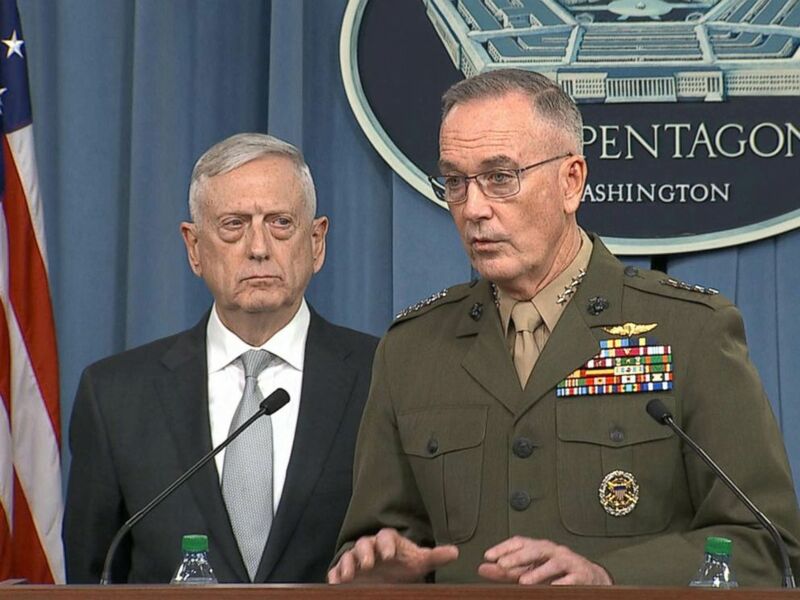 "Important infrastructure was destroyed," said Dunford. The Pentagon holds a briefing on situation in Syria after Trump announces airstrikes Friday evening, April 13, 2018. There were no reports of American losses, Mattis said. Russia was not notified before launching airstrikes against Syria, Dunford said, adding no additional strikes are planned. 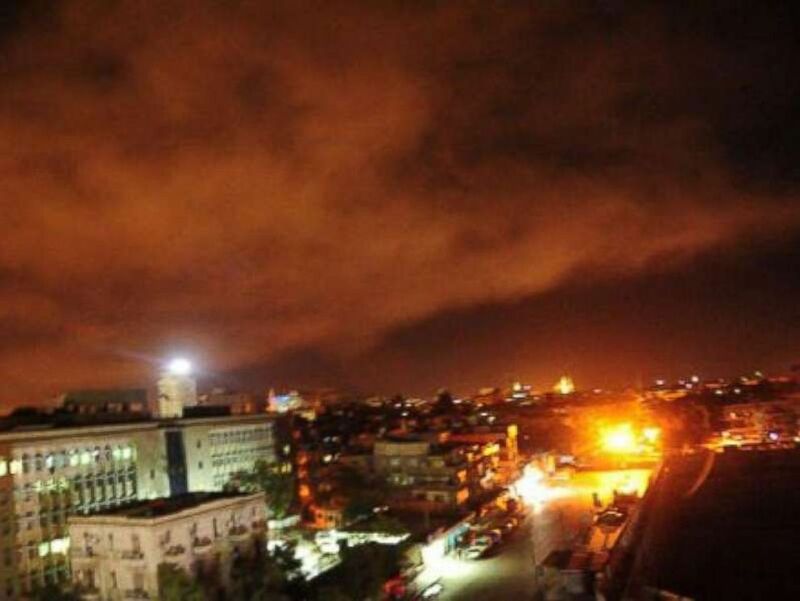 Social posts out of Syria showed flames lighting up the dark skies. Explosions could be heard as well. 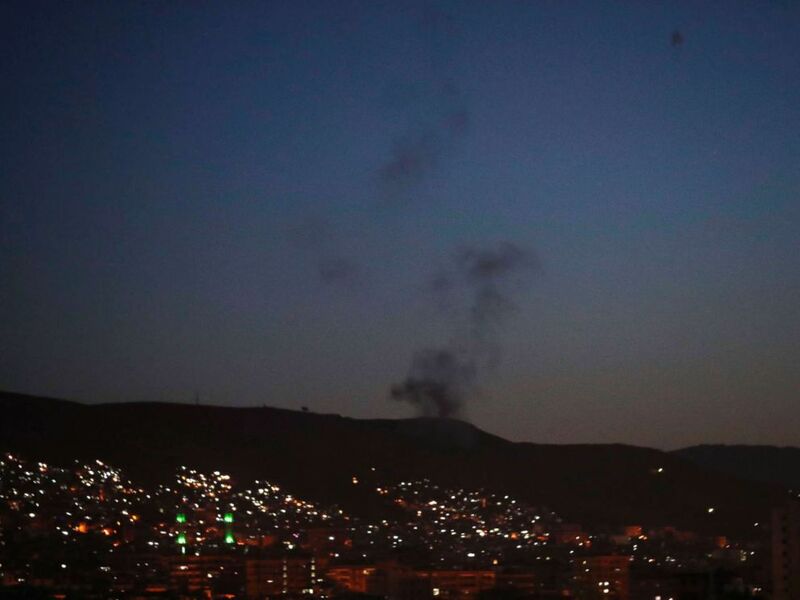 Syrian state media confirmed the scientific research center in Barzeh, north of Damascus, was targeted in the attack, adding that a number of rockets targeting warehouses belonging to the Syrian army in Homs were allegedly intercepted. The Russian Defense Ministry held a briefing Saturday in which they said 71 of the 103 missiles that were fired were intercepted. The Syrian government offered similar claims, though neither provided evidence to back up the claims. Russia also said no one was killed by any of the strikes. Smoke rises after airstrikes in parts of the Syrian capital Damascus, early Saturday, April 14, 2018.
Who are the major players in the Syrian war? In his remarks, Trump also delivered a message to Iran and Russia. "To Iran and to Russia I ask, what kind of a nation wants to be associated with the mass murder of innocent men, women and children? The nations of the world can be judged by the friends they keep. No nation can succeed in the long run by promoting rogue states, brutal tyrants, and murderous dictators," Trump said. "In 2013, [Russian] President [Vladimir] Putin and his government promised the world that they would guarantee the elimination of Syria's chemical weapons," he continued. "Assad's recent attack and today's response are the direct result of Russia's failure to keep that promise. Russia must decide if it will continue down this dark path or if it will join with civilized nations as a force for stability and peace. Hopefully, someday we'll get along with Russia and maybe even Iran. But maybe not." Putin responded to the attack against Syria on Saturday saying "an act of aggression against a sovereign state that is at the forefront of the fight against terrorism has been committed." "Very quickly we need to put options on the table to see if Russia is willing to engage in a multilateral process," a source within the French presidency said Saturday. A photo released on April 14, 2018 the twitter page of the Syrian governments central military media on April 14, 2018 shows an explosion on the outskirts of Damascus. Trump added that the U.S. "does not seek an indefinite presence in Syria." "We look forward to the day when we can bring our warriors home," he said. "... We cannot purge the world of evil or act everywhere there is tyranny. No amount of American blood or treasure can produce lasting peace and security in the Middle East. "... We pray that God will bring comfort to those suffering in Syria," Trump concluded. "We pray that God will guide the whole region toward a future of dignity and of peace. And we pray that God will continue to watch over and bless the United States of America." The strike came as Trump has alluded to military action in Syria all week, even tweeting on Wednesday that Russia should be "ready" because "nice and new and 'smart'" missiles "will be coming." But Thursday, he seemed to walk back that statement, tweeting military action "could be very soon or not so soon at all." Trump has reportedly been moved by images of the suspected chemical weapons attack on the Syrian city of Douma outside of Damascus all week, calling it "atrocious." "We cannot allow atrocities like that. Cannot allow it," Trump told reporters during a Cabinet meeting on Monday, adding he expected to make a decision on a response in the next 24 to 48 hours. The Pentagon holds a briefing on situation in Syria after President Trump announces airstrikes Friday evening, April 13, 2018. Images showed victims of the attack foaming at the mouth. Defense Secretary James Mattis and Chairman of the Joint Chiefs of Staff Gen. Joseph Dunford met with the president at the White House on Wednesday to discuss the situation in Syria. There were additional National Security Council meetings on Thursday and Friday. Trump also spoke to French President Emmanuel Macron and U.K. Prime Minister Theresa May several times by phone this week. The administration said previously any response Assad's alleged chemical weapons use would be done in consultation with allies. Defense Secretary Jim Mattis briefs members of the media on Syria at the Pentagon April 13, 2018 in Arlington, Va. In a statement Friday night, May called last weekend's chemical attack "pure horror." "The Syrian regime has a history of using chemical weapons against its own people in the most cruel and abhorrent way," May said. "And a significant body of information including intelligence indicates the Syrian Regime is responsible for this latest attack." May held a press conference with reporters early Saturday morning for about 40 minutes, taking dozens of questions from reporters. "There is no graver decision for a prime minister than to commit our forces to combat. And this is the first time that I've had to do so," May said. 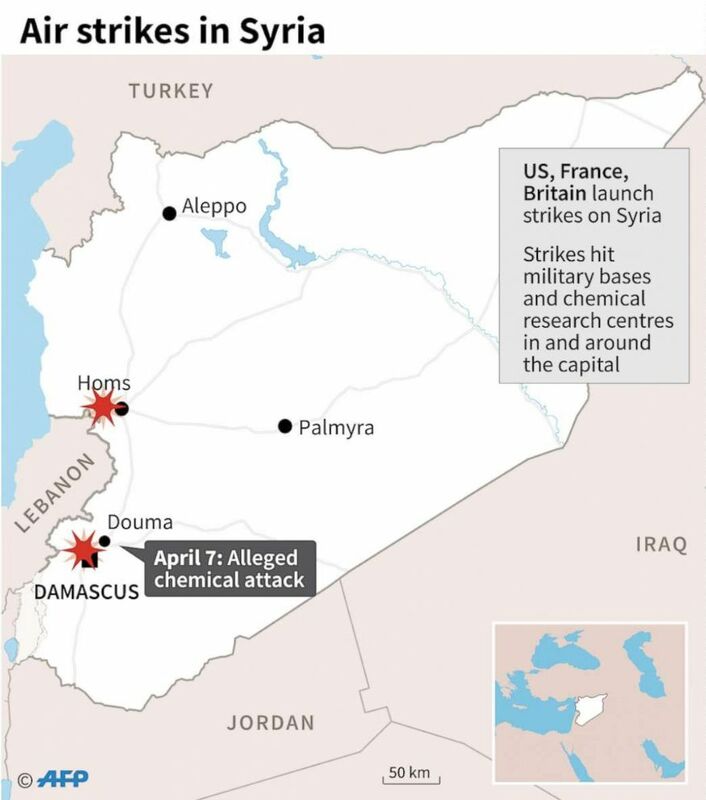 May said the attack was designed specifically to damage chemical weapons facilities and "was not about interfering in a civil war" or "regime change." She said the best option remains a "political solution." Map of locations of air strikes against Syria on April 14, 2018. Perhaps in preparation for a strike, Syria repositioned some of its aircraft from bases earlier in the week, a U.S. official told ABC News. 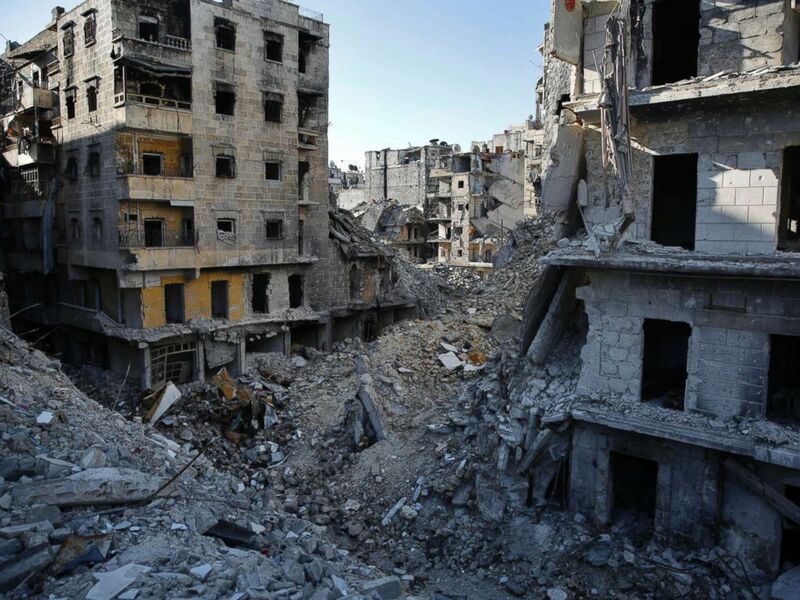 A second official said the Syrian military had gone into an increased defensive posture. Macron, meanwhile, said the response is "limited to the Syrian regime's capabilities to produce and use chemical weapons." 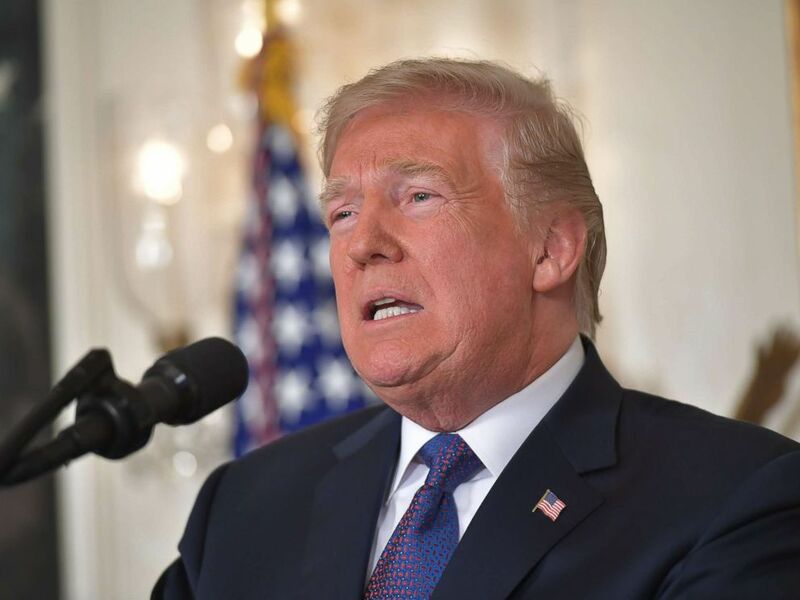 "We cannot tolerate the normalization of the use of chemical weapons, which is a direct threat to the security of the Syrian people and our collective security," he said. This Jan. 20, 2018 photo, shows the destruction of the Salaheddin neighborhood in eastern Aleppo, Syria. On Wednesday, the World Health Organization said that during the shelling of Douma, "an estimated 500 patients presented to health facilities exhibiting signs and symptoms consistent with exposure to toxic chemicals." "More than 70 people sheltering in basements have reportedly died, with 43 of those deaths related to symptoms consistent with exposure to highly toxic chemicals," the organization said. "Two health facilities were also reportedly affected by these attacks." On Friday, U.S. Ambassador the United Nations Nikki Haley said analysis done by the U.S., U.K. and France proved the chemical attack. State Department spokesperson Heather Nauert also confirmed the use of chemical weapons, but said the U.S. was still “looking into” the “exact kind or the mix” of agent used. Despite the air strikes Friday, the Organization for the Prohibition of Chemical Weapons said it will continue its fact-finding mission in Syria to "establish facts around the allegations of chemical weapons use in Douma."